Are you tired of watching your muscles stagnate in terms of growth? Going to the gym is great, but whether you do cardio or weightlifting, or a mix of both, the point is to lose fat and gain muscle, something which is often easier said than done. However, if you have the right protein powder blend in your arsenal, life all of a sudden gets a lot easier. 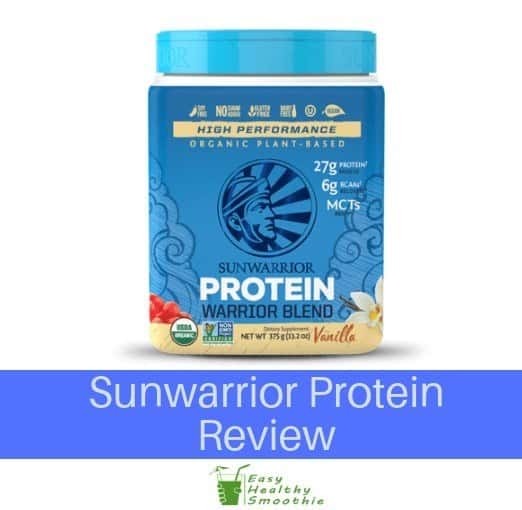 Today we are here doing this Sunwarrior Protein review to help you find a natural, safe, and effective protein powder blend that will work well for you. All natural, contains no chemicals, fillers or GMOs and is gluten free. Easy to digest for most people. Blends easily into cold smoothies. Very much dependent on personal preference. Overall a clean and easily digestible protein mix that supports muscle growth and repair! Sunwarrior Protein Blend has many different uses and purposes, thus making it more than ideal for a variety of people. First and foremost, this is of course a protein powder. This means that it helps grow your muscles and helps them recover much faster after exercising; it’s a good option to go with for anybody who likes to lift weights and who wants big muscles. At the same time, it can also help people who like to do cardio exercises, in order to help muscles heal much quicker than they usually would. Past that, Sunwarrior Protein Blend is also a good choice for anybody looking to lose weight. It has special properties that make you feel full, thus decreasing your appetite and stopping you from eating too much. Furthermore, Sunwarrior Protein Blend is also great for vegans and anybody else who is health conscious. This stuff is made to be healthy, as it does not contain any preservatives, GMOs, solvents, radiation, or coloring. This protein powder is all natural, and is also gluten free, something that many people will appreciate. When you purchase Sunwarrior Protein Blend, you get 2.2 pounds of natural vanilla plant-based protein powder. You get a nice little container with a screw lid, plus you also get a little scoop that is ideal for measuring and mixing ideal amounts of this protein powder. As mentioned before, the protein powder here is all natural, contains no chemicals or additives, it is vegan, gluten free, and the vanilla flavor is actually quite enjoyable too. For one, as we mentioned before, it helps satiate your hunger, thus stopping you from taking in too many calories. In other words, it can help you lose weight, especially when combined with regular exercise. These mix of complete proteins contains all of the amino acids out there, which not only helps you lose weight, but comes with many other health benefits too. The main purpose of Sunwarrior Protein Blend is of course to help you heal your muscles and make them grow faster after your workout. The special mix of proteins helps to quickly repair muscle fibers, thus allowing you to get back to the gym faster without fear of injury or muscle degradation. If you want quick muscle growth, Sunwarrior Protein Blend is a great option to go with. What is also beneficial about the Sunwarrior Protein Blend is that it is made to be easily digestible. Many plant-based and vegan protein powders tend to be quite hard to digest, but this is not the case here. This stuff will not cause digestion issues, plus of course being vegan in nature makes it ideal for all kinds of people to eat. The fact that this protein powder is all natural and free of any preservatives or additives is a pretty big deal too. The bottom line is that if you are looking to satiate your appetite, lose weight, and gain muscle, Sunwarrior Protein Blend is a good option to keep in mind. It is healthy, all natural, free of any additives, and is also vegan and gluten free. In our opinion, if you need a good post-workout protein blend to go with, this particular vanilla Sunwarrior Protein Blend is one of the best out there right now.